The University of Notre Dame’s Ruth M. Hillebrand Center for Compassionate Care in Medicine, the College of Science and the Harper Cancer Research Institute will host Arjia Rinpoche, director of the Tibetan Mongolian Buddhist Cultural Center in Bloomington, Ind., and seven Tibetan Buddhist monks from Labrang Tashi Kyil Monastery in Dehra Dun, India, for the construction of a peace sand mandala and a presentation on compassion from Nov. 18-21 (Monday-Thursday). The monks have been touring the United States to give teachings on Buddhism, to educate the public about the culture and religion of Tibet and to raise funds for their monastery. The monks will be ending their U.S. tour at the University of Notre Dame. Rinpoche has been raising funds for the Children’s Cancer Care Treatment Center adjacent to the Maternity Hospital in Ulaanbaatar, Mongolia. The painting with colored sands is considered the most unique and exquisite of all artistic traditions of Buddhism. This Tibetan art form is called dul-tson-kyil-khor, which means “mandala of colored powders.” The sand mandala represents many things, including the cycle of life — creation, beauty of existence and its impermanence, and finally, the return to the natural world for creation again. At 9:30 a.m. Monday (Nov. 18), an opening ceremony will be held in the Jordan Hall of Science Reading Room with the seven monks to consecrate the site of the mandala with chants, music and mantra recitation. 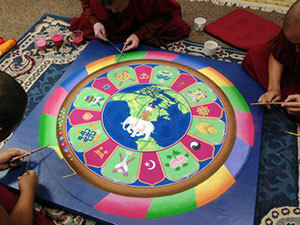 The monks will be constructing the mandala from Monday through Thursday from 9:30 a.m. to 4:30 p.m. each day. The campus community and public are welcome to visit and watch the progress of the sand mandala throughout the four days. The construction process will also be streamed live on the College of Science website. At 4:30 p.m. Thursday (Nov. 21), the mandala will be dismantled with a closing ceremony in the Jordan Hall of Science Reading Room, which will include sweeping up the colored sands to symbolize the impermanence of all that exists. A portion of the sand will be given to the guests and the remainder carried in a procession by the monks to a flowing body of water, where it will be ceremonially poured to disperse the healing energies of the mandala throughout the world. In addition to the creation of the sand mandala, Rinpoche and the monks will give a presentation called, “The Power and Practice of Compassion: Taking in Harshness and Giving out Kindness,” at 7 p.m. Wednesday (Nov. 20) in DeBartolo Hall, Room 102. Rinpoche, a prominent Buddhist teacher and lama who escaped from China in 1998, will give a talk on the practice of cultivating compassion, followed by a moving ceremony conducted by the monks to mark this occasion. The evening will be facilitated by Dominic Vachon, director of the Hillebrand Center, and Jan-Li Lin, visiting assistant professor of mathematics. The campus community and public are invited and encouraged to attend all events with the Buddhist monks and Rinpoche. These events are co-sponsored by the Department of Art, Art History and Design, the Kroc Institute for International Peace Studies, the Notre Dame Institute for Advanced Studies, the Office of Information Technologies and the Snite Museum of Art. Originally published by Stephanie Healey at news.nd.edu on November 14, 2013.